It is a multi-layered filter system that provides optimal protection against over 1,001 different types of contaminants, including arsenic, asbestos, chlorine, hormones, fluoride, lead, mercury, sodium, bacteria, giardia, viruses and more. 1.When you first use a water purifier, please open faucet and the blow down ball valve of ultrafiltration membrane shell at the same time. Then turn on the water for about 10 minutes. Rinse off the hollow ultrafiltration core protection liquid and use it without foam and odor. 3.If the water purifier is not used for more than three days, it is recommended that you open the faucet for 2-5 minutes before you use it again, and the effect will be better. 4.The ultrafiltration membrane should be kept moist for a long time. 5.Pay attention to changing the filter cartridge regularly. High Capacity Reverse Osmosis water filtration for safer, healthier water. This under sink mounted water filter and water softener removes up to 99% of over 1,000 contaminants, including lead (removes up to 98% of lead), chlorine, fluoride, arsenic, hormones, asbestos, calcium, sodium, bacteria, giardia, viruses and more. Experience clean, safe, good-tasting water every time you turn on the faucet. Enjoy crystal clear ice cubes, fresher tea and coffee, better tasting foods, healthier baby formula - even better than most bottled water. The flow rate of the faucet is 2.5 liters per minute, which can fully meet the daily drinking needs.Even if there is no water storage tank, it can be used normally. The membrane shell is integrated with the filter cartridge, so that the installation is convenient, and the safety problems such as water leakage and bursting are eliminated. All the filter cartridge are provided with joint piston for easy disassembly. The inner sealing ring of the piston ensures that the drop does not leak. Easy, do-it-yourself installation. For leak-free installation, simply push tubing ½ inch deep into quick-fitting connectors and lock - no threading pipes needed. Are you still paying extra for the brand premium? 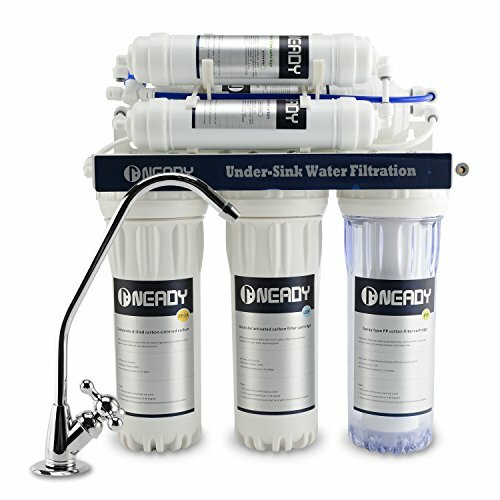 At present, many water filtration system on the market is expensive, but the actual cost is not. And our product removes the cost of this. Although the price is low, the quality is guaranteed. If you have any questions about this product by Neady, contact us by completing and submitting the form below. If you are looking for a specif part number, please include it with your message.